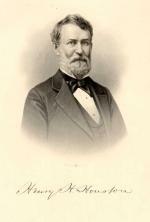 Pennsylvania Railroad director Henry Howard Houston, circa 1884. By the third quarter of the nineteenth century, a variety of forces had come together to change the face of the nation's social landscape. First, as America became more industrialized, it also became more urban. A new wave of commerce and industry created a new wave of wealth, creating a new leisure class of merchants, bankers, industrialists, and other capitalists with money to spend and time to spend it. Then, new railroads made travel easier. Those forces all affected Henry Howard Houston. Born in 1820 on his father's farm in Wrightsville, between York and Lancaster on the Susquehanna River, he left school at thirteen to work in the local general store, then moved on to building furnaces (including a stint at future President James Buchanan's Lucinda Furnace Company), before heading to Philadelphia in his mid-twenties for a job in the booming railroad business. The railroads made Houston a rich man. In time, he rose to become a director of the Pennsylvania Railroad, and his investments in the Pennsylvania oil fields secured his fortune. Like other wealthy industrialists of the time, Houston left the heart of city for the openness of the country, exchanging a house on Philadelphia's Chestnut Street for an estate in Germantown in the late 1870s. The nearby Wissahickon Gorge and its creek entranced him; he saw such potential for a new community, Chestnut Hill, that he bought 2,000 acres and put together a development plan that included a regal palace for himself on the edge of the gorge, and a spectacular home away from home for those who could afford the respite from urban life, and the relaxation and recreation that came with it. 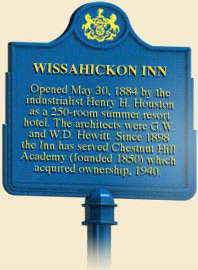 He called the resort the Wissahickon Inn, and its development was central to his plan. Two previous hotels had occupied the site, but neither were as sumptuous as Houston's lavish monument for a Gilded Age. Designed by the prominent architectural brothers George and William Hewitt, the three-storied, 250-room, U-shaped edifice with gables and dormers, a wraparound porch, paneled lobby, and dining room enclosed by a glass sun parlor took several years to build and formally opened on May 30, 1884. To help funnel the clientele, Houston made sure that a spur of the Pennsylvania Railroad would arrive at its door. It did, in early June. A match in progress at the Philadelphia Cricket Club, 1899. Patrons from up and down the East Coast, and as far away as England and Canada detrained for weeks, or even whole summers at a time, to a magnificently landscaped wonderland, a kind of rentable version of the summer cottages built by the Vanderbilts and Astors along the Atlantic coast in Newport, Rhode Island. But the inn was more than a pretty place. Since Houston's own health was so fragile, fresh air and physical activity were important to him. The inn offered plenty of both, as well as concerts, formal dinner parties, afternoon teas, and dances. There were horses and carriages available for hire. There was hiking, picnicking, and boating and swimming in summer on a man-made lake. As the weather cooled, there was indoor ice-skating; as it chilled, ice-skating and sledding. By the fall, the Wissahickon's guests could watch some of the best cricket on this side of the Atlantic. The Wissahickon Country Club's 8th hole, known as "The Devil's Own," circa 1910. Five months after the inn opened, Houston gave the peripatetic cricketeers of the Philadelphia Cricket Club their first home. An evolutionary precursor to the modern country club, the Philadelphia Cricket Club– the oldest continuing organization devoted to the playing of games in the country – was founded in 1854 by recent graduates of the University of Pennsylvania who wanted to keep playing the English game they learned in college. For three decades, they had no clubhouse or field; wherever they played, they were always the visitors. To remedy that, Houston (his own son, who died in 1878, had played cricket at Penn) donated the necessary land directly across the street from the inn. With its new base, the club immediately embraced other sports. It became a founding member of the American (later the United States) Lawn Tennis Association, and, after building one of Philadelphia's first golf courses in 1895, a founding member of the Golf Association of Philadelphia. The club went on to host the United States Open golf championships in 1907 and 1910, and the National Women's Tennis Championship from its inauguration in 1887 through 1921. Young contests at the Devon Horse Show, Devon, PA, circa 1900. The Philadelphia Horse Show, circa 1900. Meanwhile, the inn continued to flourish, reaching its zenith as a resort in 1892 when more than 10,000 arrived to watch and participate in a new event, The Philadelphia Horse Show (which evolved into the internationally famous Devon Horse Show.) After Houston's death in 1895, the inn's fortunes waned quickly. The horse show moved, cricket became less popular, and there was fierce competition for customers from newer, swanker resorts, such as The Breakers in Palm Beach, Florida; Pinehurst in North Carolina; and The Balsams in New Hampshire, that improved transportation made accessible. In 1898, the Chestnut Hill Academy began using the inn during the off-season, then moved in full-time three years later. The inn and its various outbuildings are still used by the school, but its roots extend far beyond Chestnut Hill. Houston's vision still thrives in resorts around Pennsylvania, including Shawnee-on-Delaware and Nemacolin Woods, and in golf and country clubs from Foxburg, the state's oldest, to Oakmont and Merion, whose names are trumpeted far beyond Pennsylvania's borders. The Philadelphia Cricket Club continues to thrive, as well. And while cricket itself disappeared from its menu of activities in the mid-1920s, it returned for a faithful few in 1998. Jane Alles Beever, The History of Philadelphia Country Club, 1890-1990 (W.T. Cooke Pub. Co.), 1990. David R. Contosta, Suburb in the City: Chestnut Hill, Philadelphia, 1850-1990 (Columbus: Ohio State University Press), 1992. J. Thomas Jable, "Social Class and the Sport of Cricket in Philadelphia, 1850–1880," Journal of Sport History 18:2 (1991): 205-223. Thomas and Elizabeth Farmer Jarvis Keels, Chestnut Hill (Portsmouth, N.H: Arcadia Publishing), 2002. James M. Mayo, The American Country Club: Its Origins and Development (New Brunswick, N.J.: Rutgers University Press), 1998.